This striking, curved monument on the Park's eastern perimeter honors Richard Morris Hunt, the first American to study at Paris' ecole des Beaux-Arts. He returned to New York and went on to become the city's most prominent architect of his time. His work includes the columned facade of the Metropolitan Museum of Art, just 12 blocks north of his memorial. Unveiled in 1898, the piece was created by Daniel Chester French, the same sculptor behind the massive monument to Abraham Lincoln in the Lincoln Memorial in Washington, D.C. 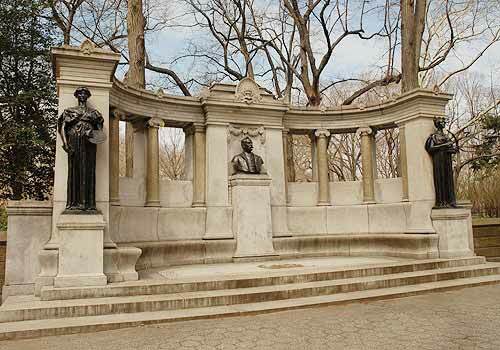 In Central Park, the Hunt monument is approached by three steps and features a central bust of the architect. A semicircular portico and curved bench support decorative columns and a cornice. At each end stands a female figure, allegorical statues of Architecture, and Painting, and Sculpture. Inscriptions on the structure name the organizations for which Hunt either founded or made significant contributions. East Side Perimeter Wall at Fifth Avenue and East 70th Street across from the Frick Museum.